This lovely mountain is located near Pangururan just to the west of Samosir island and Lake Toba. It is best known for the (very) hot springs that are located on its lower slopes and as the place where the first Batak man was supernaturally born. It is therefore regarded as a sacred hill by many Batak people and is frequently climbed whether for spiritual purposes or simply to enjoy the tremendous views from the summit. The most popular starting point is Desa Sarimarrihit (1,080m) which is southwest of the peak and about 1hr 30min from Tuk Tuk or 30min from Pangururan. To get to Sarimarrihit from Pangururan, head along the main road waords Tele, through Desa Boho, before taking a right turn up to Sarimarrihit. The starting point is the crossroads with a sign pointing to Batu Sawan on the right. You are requested to register at the Pos by the crossroads before hiking but the Pos is not always open (see below). Assuming you hike from Sarimarrihit, the trail is very clear and for the most part very wide. The most important thing to remember is to take a left turn when you reach a junction at 1,200m just before a wooden house on the Batu Sawan track. For fit hikers it should take no more than 3 hours to reach the summit and 2 hours to return. Be aware that the peak is deforested and therefore there is little shade to be found. The upside of this is excellent, panoramic views, as the trail winds its way round the peak offering vistas in many different directions. Should you have difficulty registering at Sarimarrihit (such as starting at night for sunrise on the summit), it is possible to continue further along the same road, take a right turn until you reach a narrow farm trail just beyond the Geopark / Birthplace of the Batak King (‘Perkampungan Si Raja Batak’, 1,250m). You are now west of the peak itself. From here, armed with a GPS, you ought to be able to find your way to the top though the paths are narrow, muddy and slippery until you meet the main wide trail from Sarimarrihit and Batu Sawan. Whilst the mountain has no obvious active crater as such, the hot springs on the north-eastern base of the mountain are evidence of considerable volcanic activity below. Indeed, halfway up the main trail you will be able to smell sulphur. The higher slopes of the mountain are quite lush and the views of both near and distant ridges is very pleasant indeed. You will probably meet local campers either on the summit itself or down near a large pond below the summit or even on a lower ridge to the left of the main trail. In the dark it can be difficult finding the way up to the summit as near the top there are many little paths and they seem to circle the mountain rather than going directly toward the summit. A bit of trial and error and you should be there in time for sunrise. The highest point is crowned with a large white monument including numerous dishes and places to presumably leave offerings. There are also 3 flag poles and numerous pine trees. The views down towards Pangururan and Lake Toba itself are very impressive, especially in the early morning light. Recommended as a straightforward and rewarding hike – even to the inexperienced – in one of Indonesia’s most fantastic regions. Getting there: Best done either from Medan or Silangit via the Parapat – Tuk Tuk ferry. Medan to Parapat is about 4.5 hours whereas Silangit is only 2 hrs away. The starting point is a further 1.5 hours from Tuk Tuk. Ultimately the closest airport to the mountain is Silangit which is only 2 hours in total via the road to Pangururan west of Lake Toba (no need to use a ferry from that side), but most people base themselves in Tuk Tuk. Accommodation: Available in several places on Samosir island including Tuk Tuk and Pangururan. Permits: It depends which route you take. The popular starting of Desa Sarimarrihit has a Pos building where you are supposed to register. The fee is Rp2,000 per hiker, plus Rp20,000 for motorbike parking or Rp30,000 for car parking (2017). Unfortunately this Pos seems to be closed at night which makes a night ascent from there rather awkward. Water sources: A couple of ponds on the higher slopes of the mountain for use in an emergency but we recommend bringing enough bottled water. Possibly my favourite hike of the year so far – despite a few problems getting started! Though you can stay in Pangururan near Pusuk Buhit, I thought it was worthwhile to remain in Tuk Tuk and travel an extra hour each way, mainly because Tuk Tuk is a great spot to socialise with other tourists and the food options are excellent. I asked around and if you do this as a dayhike you can find someone in Tuk Tuk to guide you (and take there and back by motorbike) for around Rp300,000. Very reasonable indeed, but assuming you don’t reach the summit until 12 noon you may not have much of a view and it may even be raining. It depends on the season. I’m very into night hiking in time for dawn views so I offered to pay Rp500,000 for someone to pick me up at 1am so we would have enough time to get there and up to the peak by, say, 5.30am. It also means less chance of sunburn on what is a rather bald hill! Jek (Jack?) (0823 6467 1731) is based in Tuk Tuk and has climbed Pusuk Buhit several times (and also Sibayak and Sinabung). He suggested picking me up at 12 midnight just to be on the safe side and I agreed, athough we did end up shivering at the summit, waiting for well over an hour for first light! It may be under 2000m but it can still get nippy up there at night so at the very least take a change of clothes and one extra layer with you. Alas the registration post was closed when we arrived there at 1.30am and we couldn’t find anyone to get that all-important permission from. We even went up to a wooden house at Batu Sawan to try to get permission but no luck there either, so we headed back down to the main road. Fortunately Jek knew we could cut across farm fields from the west and meet the main trail higher up the mountain. Whilst this was not always easy (and the GPS was invaluable, given we were navigating at night) we did manage to find out way up to the summit in about 2hr 30 min, starting from a farm trail near the Batak King village beyond Desa Sarimarrihit. The torch lights of other hikers already camping on the mountain made things easier too. There must have been at least 50 people camping on the mountain that night (it was a long weekend/ public holiday), of whom about 20 were on the summit itself. One group had brough 3 live chickens with them, presumably for breakfast! The morning was a little overcast so the sunrise was not spectacular in itself, but there was plenty of low cloud swirling around the peak and other hills making for quite a magical experience. 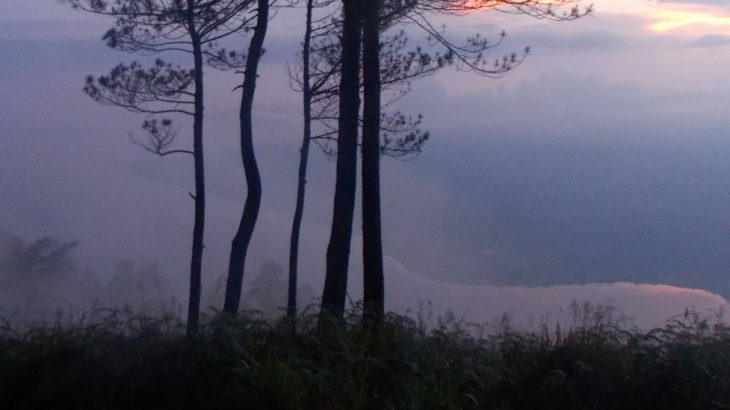 There is nothing quite like the dawn and dusk views from a mountaintop in Indonesia. Just transcendental. NOTE: If anyone uses my GPS tracks for this one please disregard the tracks on the lower slopes as this was us cutting up and down and across farm fields. The tracks on the higher slopes may be of more use! Having now almost exhausted all the hiking options that are possible from Jakarta in a regular weekend, I’ve been attempting some pretty mad weekends of almost continuous travel in order to climb something new before the end of the year. It was always going to be a tall order to get to Toba and back (and climb Pusuk Buhit) in a weekend and… I failed. It might be possible, but only if you were lucky and had everything running smoothly and ‘on time’… a very non-Indonesian concept. I flew into the new Kualanamu airport near Medan on Friday night. Very impressive – easily Indonesia’s best airport (once all of the shops have fully opened). The weather was horrendous – torrential rain. Alas, the train service to Medan from the airport is so infrequent that for most arrivals it is going to be quicker, though more expnesive to take a taxi (150,000). I checked the forecast for the weekend and it looked pretty dismal. 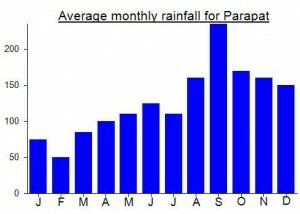 Turns out the worst times for heavy rain in North Sumatra are at the changes from dry to rainy season (and vice versa) so October and April are the months to avoid. You would expect there to be a decent, reliable and affordable transport service connecting Medan with Lake Toba and there sometimes is. A seat in one of the shared cars from Raja Taksi costs a reasonable Rp75,000. I booked one for the first departure, 9am, for the following morning. The expected happened as I got a call at 8am say ‘so 1pm yeah, mister’? I explained I had to leave no later than 9am or else I would have no time to go hiking at all. At their little office it turned out that I was the only person that morning who wanted to go to Toba. This is probably because they have no website and have not taken advantage of what an online ‘presence’ could do for their business. 9am came and went, 9.45am and still nobody else, and storm clouds gathering. Pusuk Buhit would have to wait til another time. And so a city weekend it was – Kesawan Hotel was great value for money and opposite the lovely colonial restaurant Tip Top on Jl A Yani near Merdeka Walk and the railway station. Raja Taksi can be contacted at raja_taksi@yahoo.com or 061 736555.